See this 1960 vintage film Valley of the Hunter (1960) for an overview of the formation of the Hunter River Valley across millions of years. See also: Kerr, Roslyn. Nobbys Tuff – The Rocks of Nobbys Head. [DRAFT] by Roslyn Kerr BSc, MSc, DipEd Geologist. See also: In Search of Nobbys’ Tunnels – by Roslyn Kerr, Geologist. At the entrance of Newcastle there is a small high island, called by the English Nobby’s Island. The blacks have a tradition that it is the abode of an immensely large Kangaroo which resides within the centre of the high rock, that occasionally he shakes himself which causes the Island to tremble and large pieces to fall down, as any one can perceive has been, and still continues to be the case, on the eastern side of the Island. It is evident on the slightest inspection, that at some early period the Island formed part of the main land, the strata correspond with the similar ones of coal, sand, and other stone to those on the opposite shore, nothing but a general convulsion of nature could have affected such a change. Manual labour is now employed to fill up the space betwixt the Island and the main land so as to form a breakwater for the protection of the harbour at Newcastle, and a great part of the top of Nobby’s Island has been taken down without reaching the monster kangaroo said to dwell within the rock! 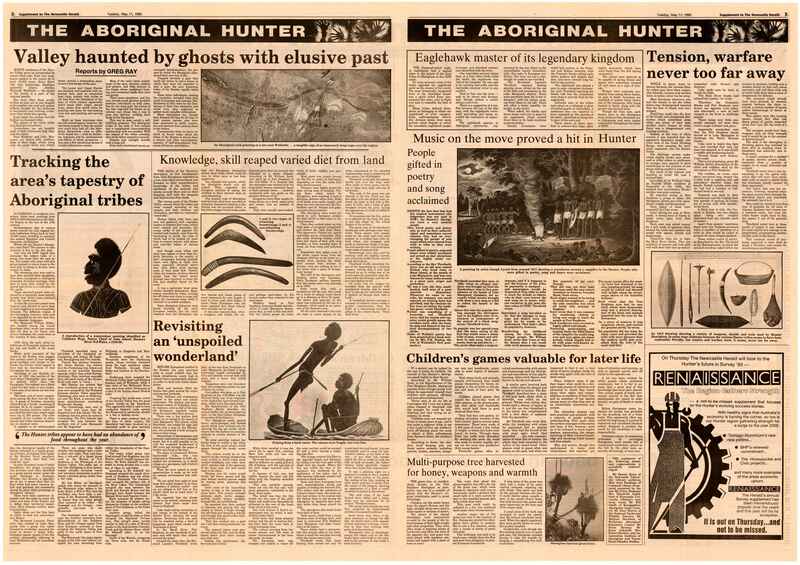 The story of the Giant Kangaroo is essentially a part of the Newcastle tribal scene that Threlkeld failed to record. The Awabakal clan of Muloobinba (Newcastle) mainly lived around Merewether and the city foreshore area and harbour entrance. 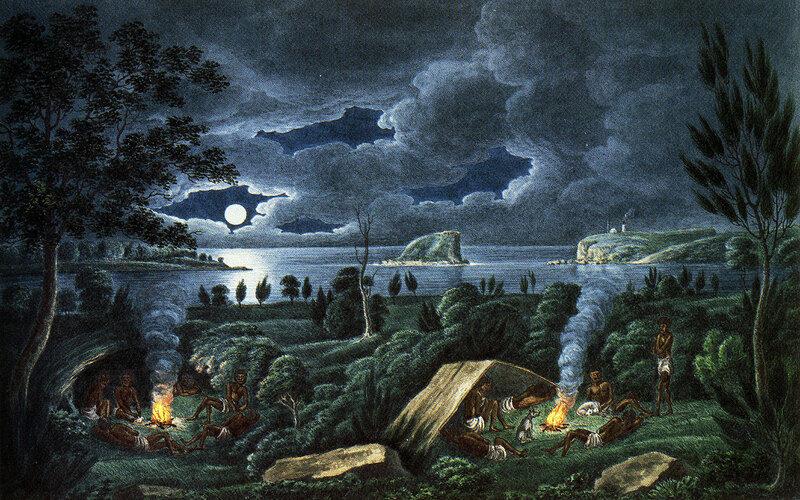 The clan had good hunting and fishing facilities, and was the reasonably close to the clans of Lake Macquarie and the Hunter River and others located in what we now deem to be old waterfront areas – Honeysuckle (site of corroborees), Wickham, Carrington and Port Waratah, popular for mud crabs and shellfish, as indicated by the large middens that have survived. So there was this giant kangaroo, selfish and lustful, who, putting desire before code of behaviour, attacked a female wallaby. Such an act conflicted with the laws governing kinship pattern of survival based on the purity of blood lines. It destroyed the totemic structure, so strongly emphasised in the Bora teaching. After the deed became known, flocks of wallabies gave chase to the perpetrator, who fled over the hills and through the bush, heading for Newcastle. Though he kept ahead by superior leaping he knew that capture and death were inevitable because the sea offered no escape. But as he neared the sea a mist intervened and he was lost to the sight of his pursuers. He took advantage of this respite by swimming to Nobbys Island, which he entered and shut himself away from sight. The wallabies gave up the chase believing the sea had claimed the kangaroo. But, according to tradition, the kangaroo was never certain of his safety. Now and then he would jump up and down his island and cause the cliff to tremble and break away as a warning to any wallabies and other animals not to come too close to his island refuge. The Awabakal are believed to be the only Aboriginal Tribe to discuss coal in their legends. They appear to have been aware of its combustibility and are thought to have used lumps of it in their fires. According to the Rev Threlkeld, the name for the Lake Macquarie district was Nikkin-bah, or place of coal. Their legend describes what sounds like a volcanic eruption, centred on Redhead, where an ancient volcanic plug is known to exist. The name of the volcanic plug is Kintiirabin. A very long time ago, when the earth and sea were different from today, a great darkness fell on the land. This darkness, which seemed to come from a hole in a mountain and block out the sun, was so deep and sudden that the people were very frightened. Even birds and insects fell silent. Messengers were sent in all directions, bringing all people together to decide how light could be brought back to the world. The wise men of the tribes decided that the only way to bring the world back to normality was to cover up the darkness that was scattered deeply on the ground. Men, women and children dug up rocks and sand and broke down foliage from trees and bushes to cover up the thick darkness. People from miles around came together to stop the darkness breaking through the surface of the earth. The people feared that the ever-burning fires deep in the ground would release the darkness again. After the darkness was covered over, generations passed in which people walked on the ground, pressing the darkness and the flames together under the earth to become nikkin, or coal. Now, whenever coal is burned, the spirit of the ancient earth fire is again released. 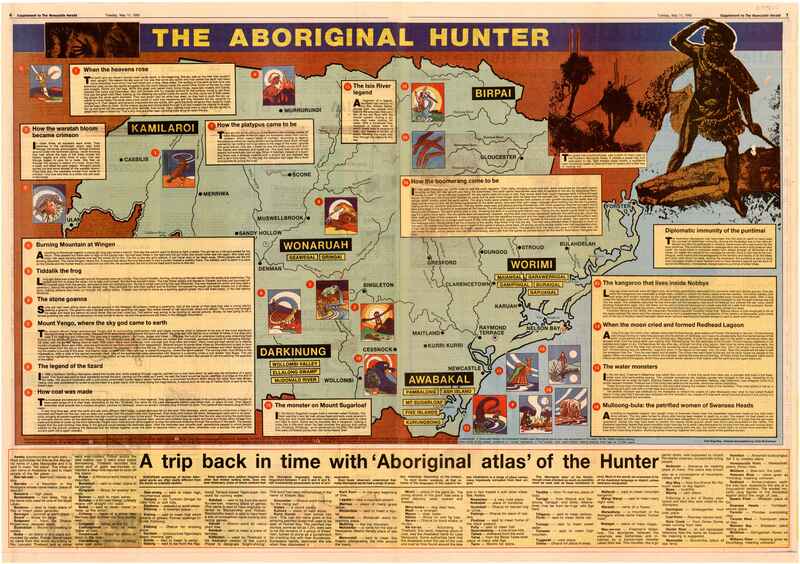 “Why the Hunter was not discovered earlier is amazing as there was an amount of traffic between Sydney and Port Stephens. As early as 1790 five escaped convicts, stole a boat from South Head Signal Station after escaping there from Parramatta in a punt. They were successful in reaching Port Stephens, where, upon putting in, their boat foundered and they were forced to live with the aborigines. According to the diary of Secretary of the Colony, Mr Collins, they were recaptured when Captain W.R. Broughton, of H.M.S. “Providence”, put into Port Stephens because of bad weather on the 23rd August, 1795. Port Stephens was visited officially in 1795 when a party, under the direction of Lieut. Col. Paterson, reached there on 21st February. This party was to spend a week exploring the area, during which time the Deputy Surveyor General, Charles Grimes, was to survey the port and to write that he could see no reason why anyone should visit there again. Lieutenant John Shortland. An eye sketch of Hunter’s River. 1797. Signed L.S. [initials presumed to be those of Lieutenant John Shortland]. Copy is held in the University Archives at Shelf Location A6472 (iii) Original is held in the Hydrographic Department. Ministry of Defence, Taunton, Somerset, United Kingdon: C642/1. J. Shortland, Jun., To J. Shortland, Sen.
My Dear Father, About a twelvemonth since I went on an expedition in the Governor’s whaleboat as far as Port Stephens, which lies 100 miles to the northward of this place. In my passage down I discovered a very fine coal river, which I named after Governor Hunter. The enclosed I send you, being an eye-sketch which I took the little time I was there. Vessels from 60 to 250 tons may load there with great ease, and completely landlocked. I dare say, in a little time, this river will be a great acquisition to this settlement. The short time I remained at this river we had rain, which prevented my doing so much as I otherwise should. Governor Hunter to The Duke of Portland. H.R.N.S.W., Vol. III, pp. 343 – 350. I have now to inform your Grace that on the fifth day of September last, as our largest and best boat, (1) belonging to Government, was on her way to the Hawkesbury River, carrying thither a few stores, and to bring from thence some articles wanted here, a service on which she was constantly employed, she was taken possession of by a part of the crew, assisted by a few men in another boat, who threatened the life of the coxswain and all who dared to oppose them. They put him and three others on shore at Broken Bay, and went off with the boat we know not whither. And as another party of those villains went off some time after in another boat, and the very men who were landed from the first, as unwilling to go, were a part of the second gang, I am of opinion it had been a long concerted plan. Not having any fit vessel to pursue upon such occasion, I dispatched two row-boats, well armed; the one went about sixty miles northward (2). along the coast, and the other forty miles southward, but without success, a gale blowing soon after the escape of the second boat, which obliged the officer in pursuit to land upon the coast. There is every reason to believe that the last party have perished, as the vessel was very feeble. (3)Most of those people were of the last Irish convicts. (3) These people remained at large until March, 1798. For an account of their movements see Collins, vol. ii pp. 52, 78, 94, 99. A small river has been lately discovered by a boat I had occasion to send northward in pursuit of the deserters: it is about sixty-five miles from this part: on its south shore and near the water a considerable quantity of coal was discovered, and specimens were brought hither. As soon as the public service will admit of my absence from hence, I propose to go thither in a boat and examine this discovery myself, after which your Grace shall be more particularly informed. Governor Hunter to The Duke of Portland. H.R.N.S.W., Vol. III, pp. 686 – 690. Excerpt relating to the situation of the coal seams. I formerly mention’d to your Grace that the coal discover’d to the southward was inaccessible, being upon an abrupt dead coast where there is no inlet to secure a boat in; but that discover’d to the northward may be got at. I have not yet had an opportunity of examining that place myself, therefore cannot say in what quantitys we may be able to procure it, and what may be the most safe and eligible way of providing a cargo for a ship; but the experiment shall be tried, my Lord, and I will endeavour myself to obtain the local knowledge requisite for ascertaining to what extent your Grace’s desire can be carried into effect. When the last accounts left New South Wales, the Governor was going to send Lieut. John Shortland (first lieutenant of his Majesty’s ship Reliance) in the Colonial schooner, to survey the coast. Some months previous Lieutenant Shortland discovered a very fine river, which it is thought will prove of great advantage to the colony, as, from the survey he then had an opportunity of taking, he thinks vessels from 60 to 250 tons may load there, and be completely landlocked. The river lays N.N.E. about 63 or 65 miles from Port Jackson. [Reprinted from the True Briton of 25th October, 1799. The river was named Hunter River, in honour of Governor Hunter, by Lieutenant Shortland, its discoverer. The native name of the river was “Coquon.” Shortland discovered the river in September, 1797, when in quest of convicts who had seized the Cumberland – the Government boat for trading to the Hawkesbury. – Ante, pp. 347, 481. As early as June, 1796, a party of fishermen reported the discovery of gold in the vicinity of Port Stephens. – Collins, (1798) p.484; (1802) vol. ii, p. 48. 1801, April 28 – August 21. 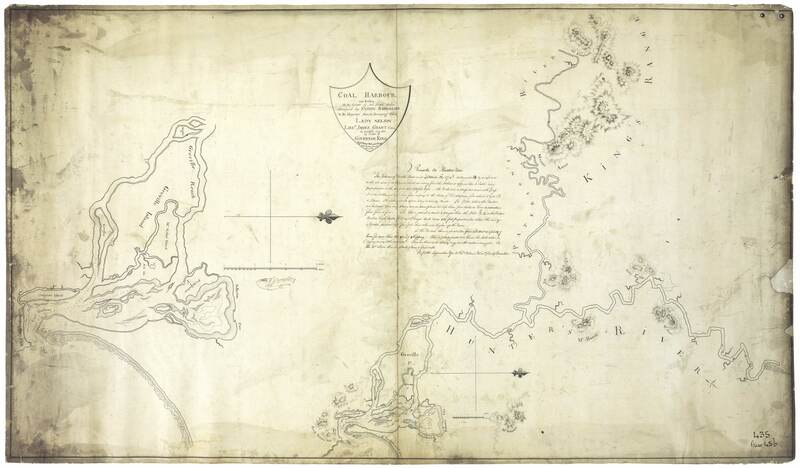 Ensign Barrallier’s map of the entrance to Hunter’s River. Held in State Library of NSW Microcard collection Catalogue no. BT36 Image 0072. Could this be the map mentioned in his correspondence to Governor King? Ensign Francis Louis Barrallier. 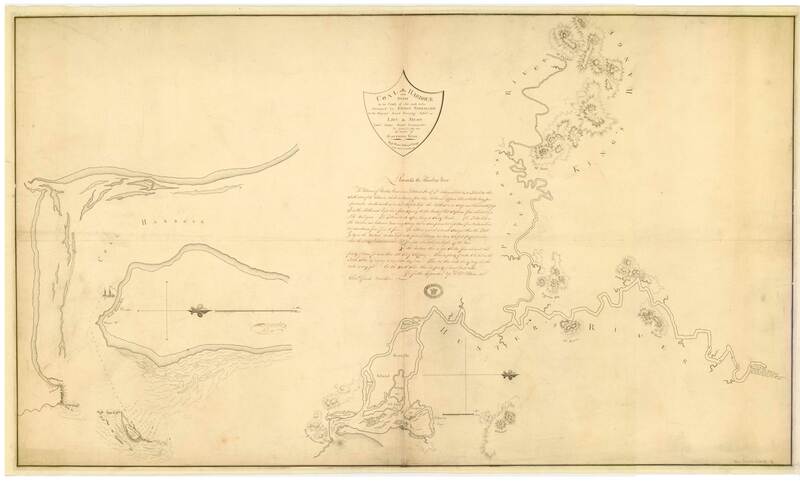 ‘Coal Harbour and Rivers, On the Coast of New South Wales, surveyed by Ensign Barrallier, In His Majesty’s Armed Surveying Vessel, “Lady Nelson”, Lieut. James Grant, Commander, in June and July, 1801. By Order of Governor King’. CO 700/ New South Wales 16/ Successfully rediscovered in its complete form by the University of Newcastle’s Coal River Working Party and presented on the 1st February 2008 by Her Excellency Professor Marie Bashir AC CVO Governor of New South Wales to the Staff and Students of Wollotuka School of Aboriginal Studies, Stockton Historical Society, the Lord Mayor of Newcastle John Tate and Vice Chancellor of the University of Newcastle Professor Nicholas Saunders. A further copy was presented to Her Excellency on behalf of the University of Newcastle by Acting Vice-Chancellor Professor Kevin McConkey. Five framed copies were made with the support of the Hartley Bequest Program. 1801, July 3 – 1818, January 3. Includes Greville’s translation of a letter received by Greville from Francis Barrallier titled `Extract from Ensign Barrallier’s Letter to Mr Greville’, ca April 1802. Contains a description of the entrance to Hunters River and Patersons River, with descriptions of the Natives seen there. [Sir Joseph Banks’ Papers ] State Library of New South Wales. 1803, May 8 Sydney Gazette, 3a. 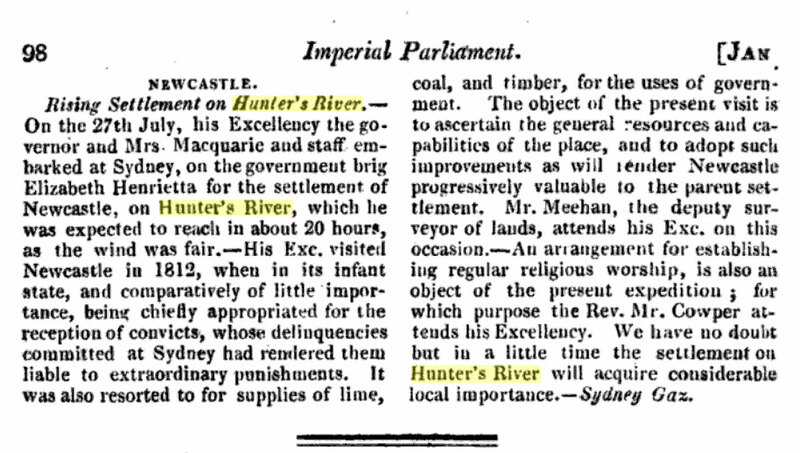 1803, June 12 Sydney Gazette, 3a. 1804, March 25 Sydney Gazette. 1804, May 27th Sydney Gazette, 1b. The Commission is dated 15th March 1804 and bears the official seal, to appoint Lieutenant Charles A. F. N. Menzies of the Royal Marines to command & superintend the settlement of Newcastle. The Commission is signed by Philip Gidley King, Governor of the Colony of New South Wales. “The very capital salt pan at King’s Town has been erected in less than a fortnight, within a few feet of an excellent coal mine, from whence it is supplied with fuel, and the water not exceeding four feet from its front. The prodigious utility of that and the other sent out by Government, which is to be erected here, will be generally felt, as has the scarcity of salt hitherto severely been. 1805, May 5th Sydney Gazette. On Friday arrived the schooner Governor Hunter, with 20,000 lbs. of salt on account of Government, made from the Salt pans worked at Newcastle under the direction of Mr. Throsby. Memoir of the Public Service of the Late Captain John Shortland, of the Royal Navy (3.2MB PDF File). Naval Chronicle Vol. XXIV pp.1-21, 312-313. Contains plate of Shortland’s Eye Sketch. Paterson, G. The history of New South Wales, from its first discovery to the present time : comprising an accurate and interesting description of that vast and remarkable country ; and of the persons, manners, and customs of the natives; with a succinct detail of the establishment and progress of the English colony; including every important particular relative to the situation and conduct of the convicts : to which is added a description of Van Diemen’s Land and Norfolk Island, with reflections on the importance of the southern continent / compiled from the best and most recent authorities by G. Paterson. Newcastle-upon-Tyne : MacKenzie and Dent, 1811. See especially Dr. Mason’s testimony relating to his time at Coal River that begins on page 568. Preston, W. (Walter). 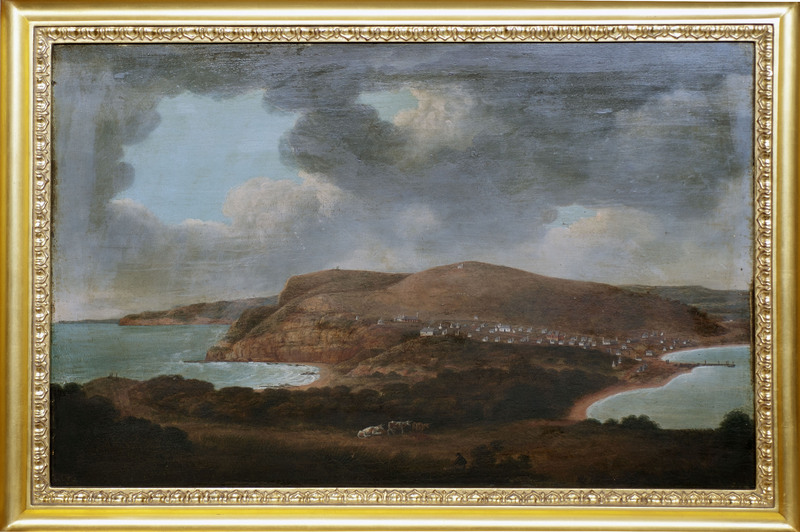 Newcastle in New South Wales with a distant view of Point Stephen, taken from Prospect Hill. Sydney : Published by A. West, Novr. 30, 1812. 1 print : engraving ; 27.5 x 40.5 cm. (Courtesy National Library of Australia). Presented as a complete Panorama identified by Mr Russell Rigby, and prepared as a 360 Quicktime Panorama by Mr Michael Meany. Be sure to view with the Quicktime Viewer for 360 effect. 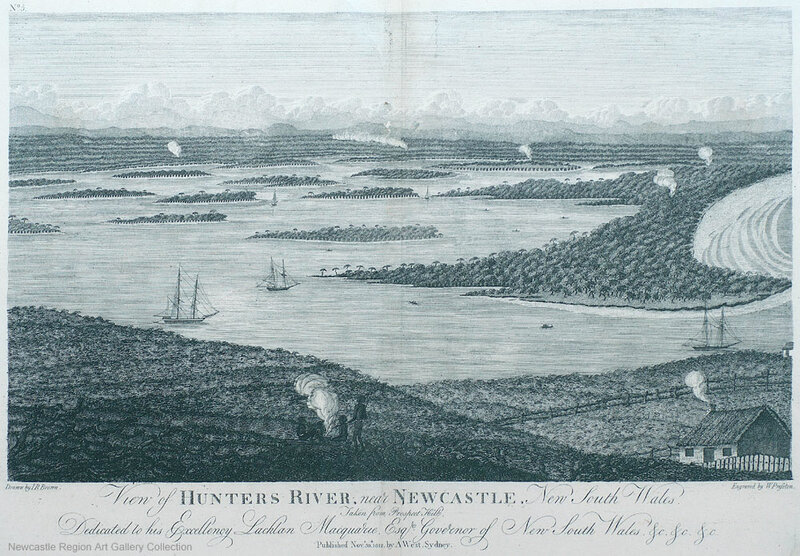 Macquarie’s Tour of Inspection to Port Stephens and Newcastle (1 – 6 January 1812) Visit to Newcastle and the coal mines. [Transcription] From Macquarie University’s Journals of Elizabeth and Lachlan Macquarie entitled Journeys in Time 1809 – 1822. (Reel 6045; 4/1733, pp. 66-71) Regarding bills of lading and account for coal shipped per “Baring” to India. 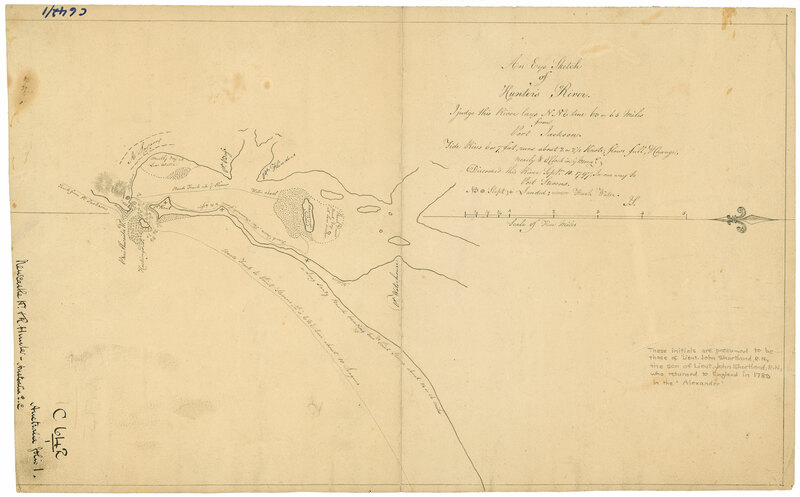 Plan of Newcastle New South Wales August 7th 1818 By James Meehan Esq. Dep. S. Gen.
Pagoda c.1818. Built by E.C. Close. Original is in the Mitchell Library. Detail from a sketch made by Thomas Mitchell during his field trip in 1828. Newcastle from the mill . Visit of Mrs Macquarie to Newcastle in 1820. As reported in the The Asiatic Journal and Monthly Register for British India and its dependencies. Volume IX January-June 1820. London: Black , Kingsbury, Parbury & Allen, 1820. p. 98. 1821, 8 August 1821 – March 1824, 1832. Macquarie’s A Voyage – and Tour of Inspection – from Port Jackson – to the Settlements of Port Macquarie, and Newcastle: – In November 1821. Visit to Newcastle and progress of the construction of Macquarie Pier. [Transcription] From Macquarie University’s transcribed Journals of Elizabeth and Lachlan Macquarie entitled Journeys in Time 1809 – 1822. Full View Panorama (1.35MB) prepared as a 360 Quicktime Panorama by Mr Michael Meany. Be sure to view with the Quicktime Viewer for 360 effect. Lycett, Joseph (ca.1775 – 1828). The Sugarloaf Mountain, near Newcastle, New South Wales. 1824. Jackson, J.A. Newcastle From a Sketch by J.A. Jackson, Esq. [c1840] University of Newcastle John Turner papers. The Adventures of Ralph Rashleigh A Penal Exile in Australia, 1825-1844 by James Tucker (1803-1866). A Project Gutenberg Ebook. First published in 1929 by Jonathan Cape. ‘This 1929 text was the first edition of the manuscript and was substantially edited. It includes an introduction by Frederick Edwin Smith, The Earl of Birkenhead (1870-1930). The 1844-45 manuscript of the novel cites the author as Giacomo di Rosenberg, presumed to be a pseudonym of James Tucker.’ For the 1952 edition ‘first authentic edition’ is under the title of Ralph Rashleigh. Includes a novel account of life as a convict at Newcastle. Rae, John, 1813-1900. 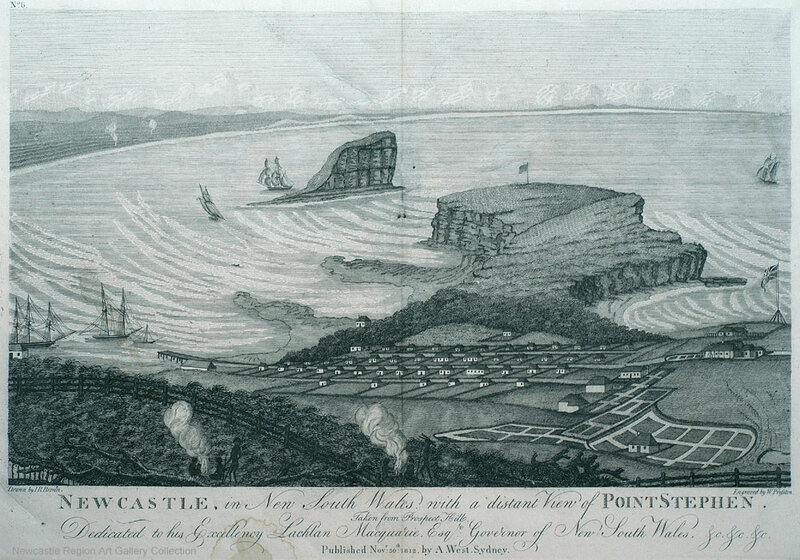 Newcastle in 1849. New South Wales. Parliament. Legislative Council. Nobby’s Island. Laid upon the Council Table by The Colonial Secretary, and Ordered by the Council to be Printed, 18th July, 1854. Papers relating to the blowing up of Nobby’s Island. [727KB PDF file] Thanks to the New South Wales Parliamentary Archivist. Legislative Assembly. New South Wales. Breakwater at Stockton. (Report of Mr. Moriarty Upon Advisability of.) Ordered by the Legislative Assembly to be Printed, 27 April 1858. [5.9 MB PDF File] With Moriarty’s Plan of the Harbour of Newcastle Shewing the Proposed Extension of the Northern Pier. Thank you to Mr Rod Caldwell who kindly arranged for his personal copy to be digitised and provided for us to publish to the wider research community. “Official Inspection of the Fortification” Newcastle Morning Herald & Miners Advocate, p.4. Official Inspection of the fortifications by Colonel Roberts and Colonel Richardson on Allan’s Hill. View from Allan’s Hill (Signal Hill) now Fort Stratchley. The 1886 painting of Newcastle, named Nobbys, from the John Turner papers appears to be a painting of a more detailed etching from the Illustrated Sydney News on the 15th February, 1886.